Police Foundation CEO Sara Napoli tells Walmart associates about the programs the grant will support. 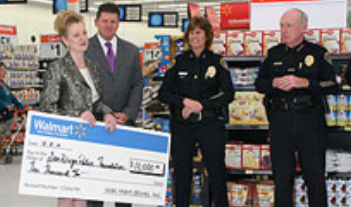 Walmart is partnering with the San Diego Police Foundation in a public awareness campaign to educate young families about Internet-facilitated crimes and the dangers they pose to children. Below are photos from the recent check presentation at which a $10,000 grant was awarded to the Foundation for this work. 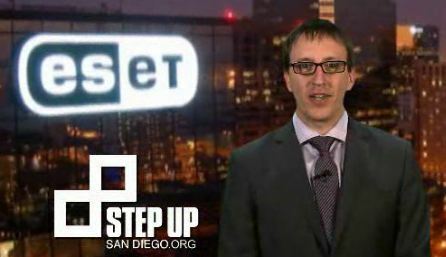 With donations from ESET North America and Mission Federal Credit Union, StepUp San Diego is hitting the media this week with the first in a combined program that helps support non-profits in San Diego County. TV commercials will be used in the coming month to promote SafetyNet: Smart Cyber Choices™, a partnership of the San Diego Police Foundation and the San Diego Internet Crimes Against Children Task Force whose goal is to educate middle school children on cyber security. StepUp San Diego is a collaboration that has been developed over the past two years with leadership from Parker Pike at UCSD and the cooperation of multiple corporate partners and media partners throughout the county. The mission of StepUp San Diego is to provide support for smart and effective non-profits in the area. In late 2010, StepUp San Diego joined with the San Diego Association of NonProfits to oversee the future of the initiative. 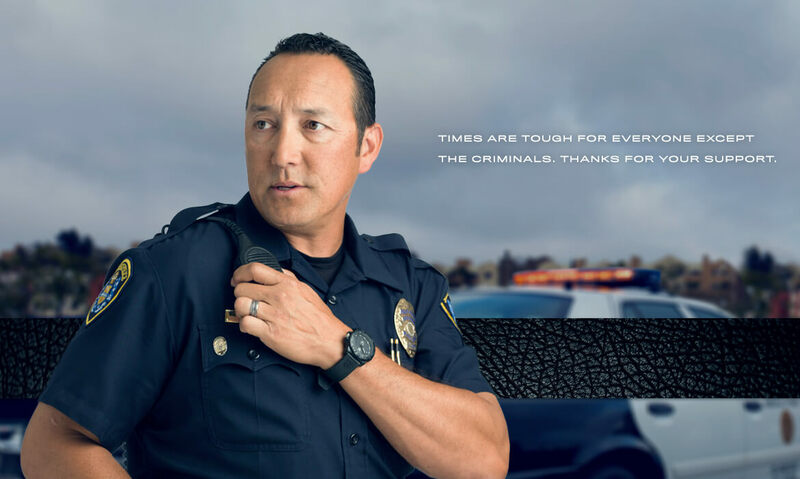 The SafetyNet: Smart Cyber Choices™ program of the San Diego Police Foundation is the recipient of publicity through the sponsorship of ESET and their work with Securing Our eCity. 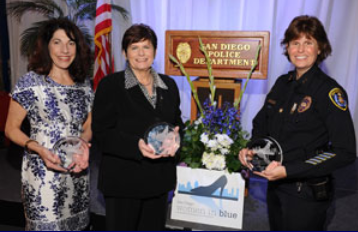 At its inaugural Women in Blue luncheon, the San Diego Police Foundation named three honorees: San Diego County District Attorney Bonnie Dumanis, San Diego’s First Lady Rana Sampson, and San Diego Police Department (SDPD) Assistant Chief, Shelley Zimmerman. Considered trailblazers in nontraditional careers, the honorees shared insights and anecdotes from their paths to success. The event was attended by 150 women and men from the business, nonprofit and government sectors at Donovan’s Circle of 5ths restaurant in the Gaslamp Quarter. Dumanis is the first women to serve as District Attorney of San Diego County. Previously she was a Superior Court judge and a Deputy District Attorney. Sampson, wife of San Diego Mayor, Jerry Sanders, is now the director of development and marketing at the San Diego Center for Children. Earlier in her career, she was an NYPD undercover narcotics officer and patrol sergeant. Since then she has had a distinguished national career as a crime consultant. A 28-year veteran of the SDPD, Zimmerman now oversees the Neighborhood Policing section of the Department. She has earned numerous Exceptional Performance and Commanding Officercitations, and recently received the Exemplary Award presented by the San Diego Business Journal-Women Who Mean Business Awards. Women in Blue is a program of the San Diego Police Foundation. Wells Fargo Bank was the lead sponsor of this year’s event, which was presented in affiliation with the San Diego Business Journal-Women Who Mean Business Awards. 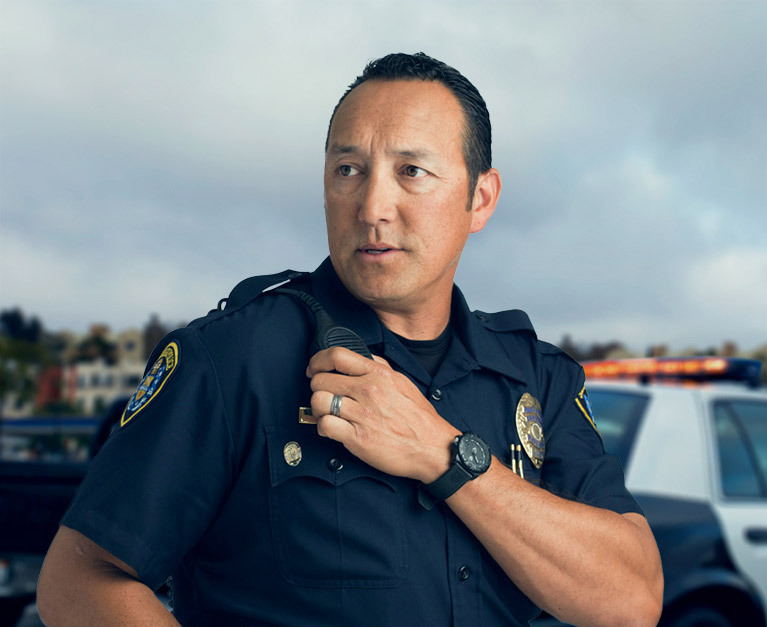 Proceeds from Women in Blue will support the San Diego Police Foundation’s work, to provide unmet needs for equipment, training and outreach for the SDPD, and the award-winning SafetyNet: Smart Cyber ChoicesTM program.